The land between Washington, D.C. and Baltimore is a land full of rivers and streams. These rivers get some of their water from Appalachian springs, but the rest comes from the rainy season that starts up every spring and doesn’t truly end until winter. And even then, it’s only to dump the occasional load of snow instead. All these rivers are excellent for recreation, especially in relatively quiet, well-off neighborhoods like Ashton and Sandy Spring, which are often grouped together. Ashton-Sandy Spring sits right between the T. Howard Duckett and Triadelpha watersheds, and the woodlands surrounding them are open to boating, fishing, horseback riding, and birdwatching. Unfortunately, all the rain that fills these reservoirs also poses a danger to the homes and other buildings in the area, and even the humid Maryland summers can cause mold outbreaks if a house doesn’t have the equipment to handle it. And if you find yourself with a mold problem you can’t solve with ordinary cleaning supplies, you should call AA Action Waterproofing to get a professional mold remediation in Ashton-Sandy Spring. There’s really no getting away from mold spores. From the mountaintops to the valleys, from the thick rainforests and even to the barren deserts, mold spores can float anywhere. Fortunately, they can’t grow just anywhere: they need a rough surface to anchor to, some sort of food source, and enough moisture to multiply. For the most part, mold also can’t grow in living creatures. However, that doesn’t stop spore clouds from having a negative effect on your health. The term “black mold” refers to several species whose spores carry mycotoxins that can cause health problems in large enough concentrations. Sometimes described as an allergic reaction, symptoms of black mold exposure include sneezing, headaches, dizziness, fatigue, and other cold-like symptoms. While these symptoms aren’t likely to be life-threatening, no one should have to live with the misery of a respiratory allergy in his or her own home. 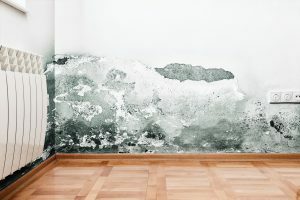 Black mold is one big reason you should clean your residence on a regular basis, and it’s why you should call AA Action Waterproofing for a mold remediation in Ashton-Sandy Spring or any other Washington or Baltimore suburb if your mold problem has gotten out of control. We operate our mold remediation in Ashton-Sandy Spring the same way we run it in the rest of our service area, which includes the state of Maryland and beyond. The first step is a professional inspection of the property, especially basements, crawlspaces, and other areas that are most likely to play host to a major mold problem. This initial inspection is especially important because mold problems are often more than skin deep. Fortunately for you, it’s also free. Often enough, a big mold problem isn’t as serious as it seems. It may look bad, but if it’s only on the surface you can often handle the problem yourself by repairing any leaks in your pipes, placing a dehumidifier in your basement, and then going to work on the mold with a tough cleaner. However, if the mold has started to grow into the wood, concrete, or other material it’s on, you’ll be glad you contacted AA Action Waterproofing for your mold remediation in Ashton-Sandy Spring. 1. Waterproofing. Life can’t exist without water, which is one reason why houses and other buildings are carefully designed to keep water out. Our first step is always to find out how water is getting to the mold patches and to plug them, because if we don’t the mold will come back. 2. Quarantine. The cleaning process releases a lot of mold spores, so we isolate the affected area to keep them from getting into the rest of the building. 3. Cleaning. This involves completely sterilizing the mold growths and possibly even removing parts of the house where the mold has completely infiltrated the material. 4. Repairing. Once the mold infestation is gone and the spore count is back down to acceptable levels, it’s time to return what could be cleaned and replace the pieces that had to be thrown out entirely. For mold remediation in Ashton-Sandy Spring, Olney, Aspen Hill, and beyond, make sure you call on the experts of AA Action Waterproofing. We’ve been in business for three decades, and we’ve never seen a mold problem we couldn’t solve.